The world ash tree of the computer hardware industry… crystalline silicon from 1854. The element silicon best represents the digital era of the mid 20th century to the present; without its crystalline form, there would be no computers (or this blog). Although it was first prepared in pure amorphous (powder) form around 1823 by Berzelius, it was not until 1854 that Henri Sainte-Claire Deville made it in crystalline form, using metallic aluminium to isolate it. He described it  as having a “metallic luster”. Well, an actual sample of his silicon has survived since he prepared it in 1854,‡ and so this tiny crystal could reasonably be argued to constitute the origin of the modern computer hardware industry. It is worth juxtaposing this on a modern sample of the element (below). There is indeed a metallic luster (Deville’s sample is about 2mm in size, did I imagine it too having a luster?). Oh, the artist in me came out when I photographed the below. 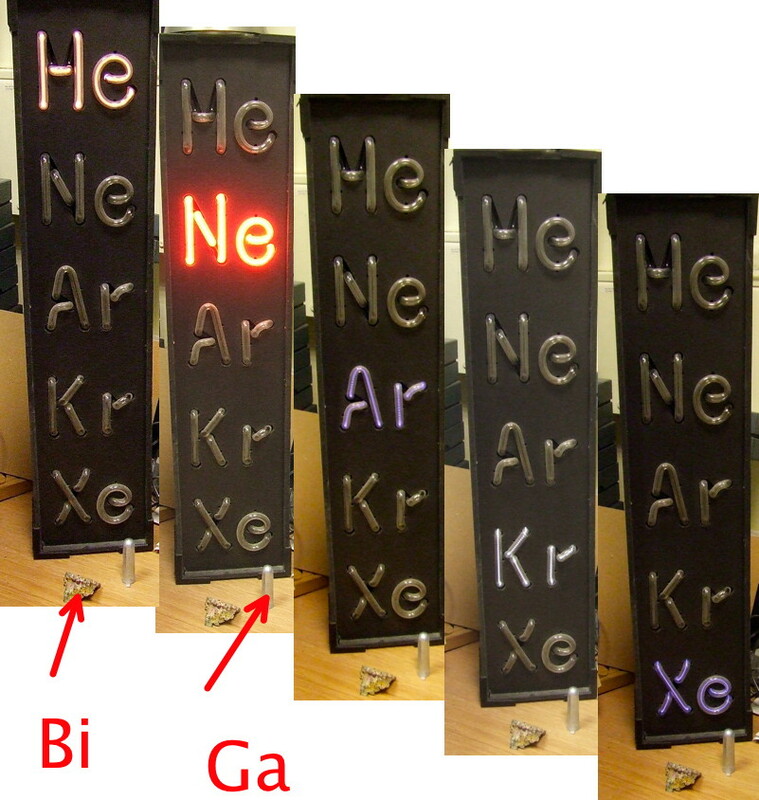 The red tinge is because I illuminated the crystals with light from a neon tube (an original sample does still exist at University College London, not more than a few km from where I write this blog). Original element samples, by definition, are both finite and rare. The Royal Institution in London (again just down the road from where I am) has perhaps the largest collection of mainstream elements (groups I and II) prepared by Davy there,† but there is no catalogue I am aware of which lists all the original elemental samples still existing and their location in the world. I suspect the majority are no longer around. But I would welcome anyone who knows of the location of such to post a comment, perchance even a photo, here. ‡The provenance is impeccable. † Potassium (1807), sodium, barium, calcium, magnesium, strontium and boron. See here for photos of modern samples. This entry was posted on Thursday, October 31st, 2013 at 9:51 am and is filed under Interesting chemistry. You can follow any responses to this entry through the RSS 2.0 feed. You can leave a response, or trackback from your own site. I mentioned Berzelius as the discoverer of the element silicon. I might add he also discovered cerium, selenium and thorium. But not Yttrium. 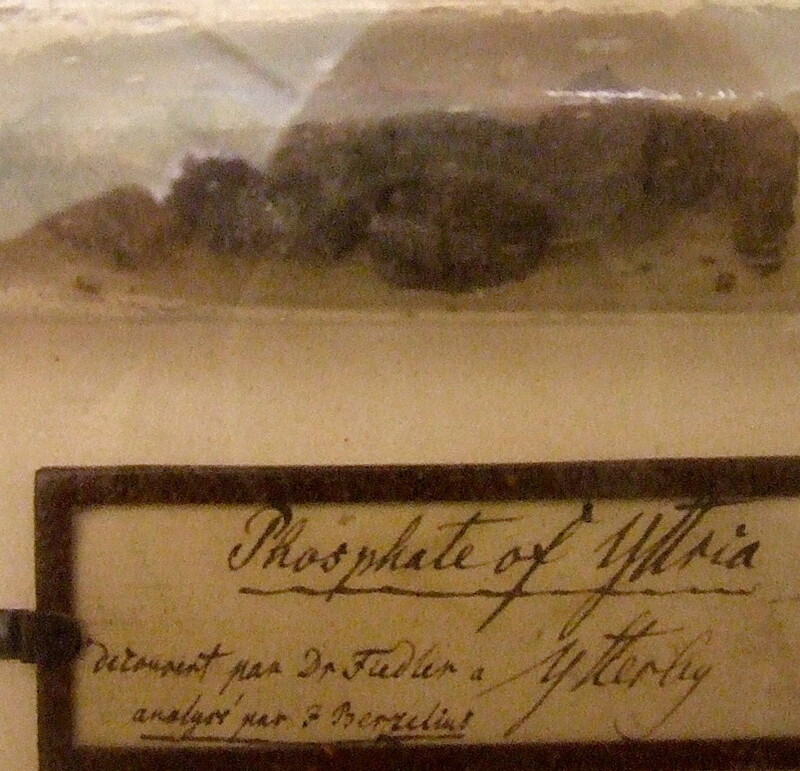 But here is a photo of a sample of yttrium phosphate (it was Wöhler who actually isolated the metal, in 1828) which appears to have passed through his hands. I include the photo here, since its attribution is to a Dr Fiedler, but its analysis was actually carried out by a J. Berzelius. The world ash tree of the computer hardware industry… crystalline silicon from 1854. is licensed by Henry Rzepa under a Creative Commons Attribution-Noncommercial-Share Alike 3.0 United States License.